After its establishment in the end of 2013, Tan Uyen Town of the southern province of Binh Duong has changed from rural district with backward agriculture into a civilized waterway tourism town. In an exchange of views with Sai Gon Giai Phong reporter, Chairman of People’s Committee in Tan Uyen town, Mr Doan Hung Tuoi talked about the process. The town achieved all growth standards of the government’s rural plan; amongst them, economy has seen to maintain its development speed rather well, Mr. Tuoi said Authority pays attention to take care of people’s living condition. Accordingly, social security and welfare are top priority while culture, education and medicine activities are well organized for locals meantime political situation is stable. For years, People’s Committee has spent on beatifying the town’s face. It has completed the project to submit to the government proposing to recognize the town as the third-class city hoping that it will be recognized this year. According to the town government, economic development must go along with social development and environment protection; three of which are foundation for stable growth. For years, town administrators have reached to an agreement for selecting investment; therefore, projects utilizing environmentally friendly hi-tech will be top priority. 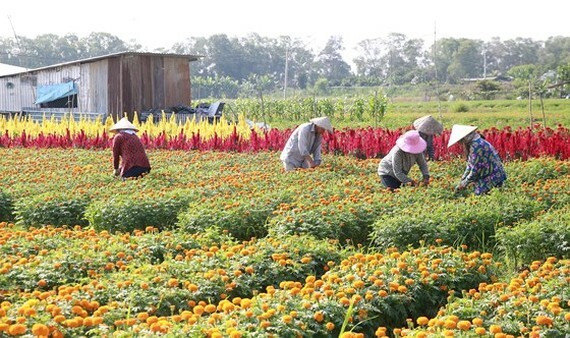 Additionally, it has also prioritized to develop hi-tech agriculture connecting with waterway eco-tourism because the town has Bach Dang and Thanh Hoi islands. As per the Politburo’s decree No. 08 and the province’s tourism plan to 2020 with the vision to 2030, Tan Uyen is chosen to develop into a waterway tourism location. Last year, the town organized grape fruit festival Bach Dang attracting over 5,000 visitors. This begins for tourism activities later. In 2018, it will liaise with tourist agencies to open more waterway trips from Ho Chi Minh City to Dong Nai River stopping in Thanh Hoi and Bach Dang islands for Rua Island- the national-level vestiges, , grape fruit garden, voluntary base D, Vinh Loi. Moreover, it plans to work with Mekong Golf & Villas Company to build roads connecting the town with neighboring districts. For long -term, promotion campaign and calling for social contribution to ports, hotels, and restaurants will be carried out. Local government encourages to set up UNESCO-recognized “Don ca tai tu” (southern folk music) as an intangible cultural heritage of humanity to serve tourists’ demand. In addition, it will call for more economic projects along with tourism projects. For past years, it also completed overall plan for socio-economic growth by 2025; focusing on the building of Nam Tan Uyen and six communes as well as implementing the government’s rural plan in six communes. It has management mechanism for zoning and architecture aiming to improve locals’ living condition and change the town’s face.